On April 1, 1960, a letter was mailed to Howe Sound Company, Chelan, Washington. 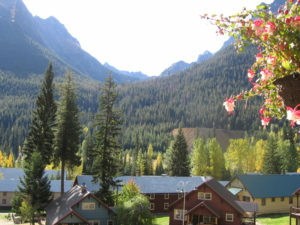 Howe Sound owned a mining village in the Cascades above Lake Chelan. Wes Prieb, a student at Seattle’s Lutheran Bible Institute (LBI), wrote the letter … on LBI stationery. When Prieb first announced the offer, some Lutherans thought it was an April Fool’s joke. It sounded “phony and a bit ridiculous,” said LBI President E.V. Stime. But two months later, LBI decided to have a look. Visiting the property was a team including Stime and Prieb, who’d just finished his LBI studies. They were impressed by its possibilities and recommended that LBI receive the gift. By December 1960, negotiations with Howe Sound for legal receipt of the gift were finished. Because the town sits on Forest Service land, that federal agency needed to okay its operation as a church facility — and it did. A permanent Holden board was created, with representatives from LBI and national youth offices; it first met in May 1961. And because LBI declined any permanent responsibility, a separate Holden corporation was created. Holden was envisioned initially as a program center for youth and young adults, and the younger generation did provide vital volunteer service during restoration work (the summers of 1961 and 1962), plus during Holden’s half-century of service since. But from the beginning, Holden has welcomed families and offered programs for all generations. Also from its start, Holden’s leadership has been bi-national (Canada/U.S.) and inter-Lutheran. Active in the early ’60s were youth leaders from these bodies: The American Lutheran Church (ALC), the Augustana Lutheran Church, the Lutheran Free Church, the Lutheran Church—Missouri Synod (LCMS), and the United Lutheran Church. Holden’s board today includes persons from the Evangelical Lutheran Church in Canada, the Evangelical Lutheran Church in America, and LCMS. Two of Holden’s early on-site leaders came from Lutheran youth leadership, and from Minneapolis. Wilton Bergstrand, youth director of the Swedish-background Augustana Church, in the summer of 1961 directed nearly 50 work-campers who prepared the Village for receiving guests. The next summer he and his wife Dolores Bergstrand provided program leadership for the first guests. What about the young man whose letters led to Lutheran inheritance of Holden? When asked what he had hoped his inquiries might accomplish, Wes Prieb would say he never expected Howe Sound to “give the property away, but I hoped they would reduce the price, or some miracle might happen.” Prieb spent much of his later life there, serving as Holden’s PHD (pool hall director) for 32 consecutive summers, from 1968 through 1999. He died in early 2000. Holden has been a prized destination for Minnesotans. Its attendees over the past half-century have been outnumbered only by those from Washington state. Through all its Lutheran life, Holden has been acutely aware of living with mine remains. Drainage from inside the mine cavity and ore tailings outside have contaminated the environment. The federal government decades ago declared it a disaster area needing cleanup. Rio Tinto, a large mining corporation, has accepted responsibility for massive mine remediation; now under way, it will be completed in 2015. During construction seasons (May-November) Holden houses remediation workers and volunteers doing Village renewal, leaving no room for guests. In 2013 its revised summer program included “Holden on the Road” — at locales across the continent, several of them in Minnesota. Now Holden is launching “Refresh, Renew, Rejoice,” a capital campaign seeking $4.8 million. It will follow mine cleanup with restoration of Holden’s 75-year-old buildings and infrastructure. Village friends, old and new, are asked to help. For specifics, visit www.holdenvillage.org or email development@holdenvillage.org. So, 54 years after Wes Prieb’s April First letter, Holden Village continues, a gift serving both church and world. Always, it serves with fun — and that’s no April Fool’s joke! Charles P. Lutz, editor-emeritus of Metro Lutheran, is a member of Lutheran Church of Christ the Redeemer (ELCA), Minneapolis. He is author of Surprising Gift: the Story of Holden Village, Church Renewal Center (Holden Village Press, 1987).